Please refer to our stock # 3342 when inquiring. 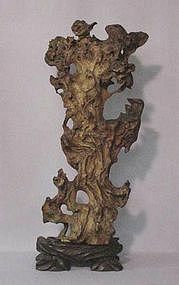 This mid or late 19th century Chinese carved root sculpture is 25 inches tall (with base), 11 inches wide and 3 ½ inches deep. One side carved as a maple tree and rock, the other side retains the natural form of the roots. The fitted hard wood base depicts a pine tree surrounded with rocks. There have been a few minor repairs. It is in excellent condition.